Financial Lessons From "Sons of Anarchy"
The gritty bikers in this television series generally have to live within a fairly tight set of financial parameters…parameters some of us could learn from. These savings tips from “Sons of Anarchy” are some of my favorites from the show. Older vehicles can be a savvy way to avoid the larger monthly payments often associated with newer vehicles. Two examples of this from “Sons of Anarchy” are the Cutlass driven by Tara when she returns to the town of Charming and the older motorcycle driven by Bobby Elvis. Granted, you need to have mad mechanic skills or have access to someone who charges affordable rates for those skills in order to make it work, but the lower insurance rates alone make this a worthy savings strategy. And you don’t necessarily need more than one car, either — for those who typically require an additional automobile, a money-saving vehicle alternative exists through the purchase of a cargo trailer. Gemma Teller, played by Katey Sagal, plans a breakfast for the club members and their significant others. It’s something anyone with a bit of free baking time can pull off affordably. Filling a coffee urn, baking some tater tot casseroles, and preparing some scrambled eggs for a warming tray to serve breakfast burritos are all great ways to start. This is a popular choice among close friends who want to get together to catch up without having any one person overburdened with food preparation at the end of a busy week. It’s also one demonstrated on “Sons of Anarchy,” typically at the Teller residence. Whether you lean towards easy crock pot recipes or enjoy making your own sushi, chances are you have a few go-to recipes for potluck events. If you haven’t thrown one in a while, consider giving it a try to catch up with some best buds you may have lost touch with. You don’t have to watch “Sons of Anarchy” for very long before you realize that most of the show’s characters don denim on an almost daily basis. While there are plenty of fashion looks on the program I’d personally like to avoid, denim is an incredibly durable fabric that makes a pair or two of jeans a smart clothing purchase. This is something I address further in my piece on cool-weather fashion staples. Whether you enjoy the biker look portrayed on the program or prefer something a bit more preppy, jeans are a classic item that you can wear for years and work well with everything from T-shirts and dressy sweaters to button-down tops. When they finally wear out, there are numerous things you can do with old jeans in order to make the most of your original purchase. Granted, the example set by Drea de Matteo’s character Wendy is one that you should try to avoid at all costs, but the lesson is an important one. Choosing to abuse your body and your health during pregnancy can result in permanent problems for your unborn child…problems that will likely have a high dollar amount attached to their care. Doing your part with nutrition and checkups is a worthy investment. While not every mother in the show has day-care provided as part of their employment package, Tara does. It’s an excellent reminder to think outside of the box when it comes to negotiating contract perks or to shop for employment options that come with this particular benefit attached. OK, so developing a controlling interest in an adult film company might not be my first choice or yours to add to the revenue stream from an automotive repair shop like the one on Sons of Anarchy, but the point is a sound one. Having an additional revenue stream protects you from unexpected dips in your primary revenue source, just like smart bulk buying can keep you in financial check when you are down with the flu or a broken limb. Divorce can provide a serious detour to your long-range financial plan. So can the financial choices of a spouse who doesn’t share the same fiscal priorities that you do. While the dynamics of any marriage are obviously far too complicated to condense to a single paragraph in a tips list, suffice it to say that making an informed marital decision just makes good sense. Characters from the story that have apparently not done so are varied, but the Jax and Wendy situation is one example. The Bobby and Precious marriage is another. Each demonstrates the residual financial difficulties that can occur from a poorly-made match. There are a couple of episodes in “Sons of Anarchy” where this is demonstrated. One is when Tara saves an extra high chair in storage until one of the other club members needs it, and the other is when Jax purchases a second-hand play pen from Opie and Donna when his first child is born. Whether you have regular “stuff swaps” with friends or frequently participate in the neighborhood yard sale scene, shopping for second hand goods is a smart savings strategy to turn into a habit. A strong support system contributes greatly to your ability to save. Whether it’s sharing tools and home maintenance equipment with neighbors, swapping mending support for casserole drop-offs, or shuttling a friend’s teen home from soccer practice, the benefits of a reliable support network are significant. Several examples from “Sons of Anarchy” come to mind, including the compound lock-down, extra security provisions for individuals in danger, and neighborhood fundraising efforts for a community garden and the school’s music department. Speaking of which, I’ve often found it noteworthy how open the biker community in general is to participating in fundraising rides for a variety of causes. Whether you focus on how often club members need individual medical care, the instances where characters like Tig and Chibs find their health plans lacking, or the amount of time Abel had to spend in ICU after he was born, it’s clear that maximizing your medical plan makes good sense. Take some time to review your policy and job benefits to make sure you’re getting the biggest bang for your health care buck. Medical savings plans stocked with pre-tax dollars and prescription co-pays are two places to start looking. Funerals tend to be extremely emotional affairs and, as such, set up a situation where those picking up the tab are vulnerable to overspending. Depending on your religious beliefs regarding burial practices, there may be more affordable choices at your disposal. The example that comes to mind is the graveside service held for Opie’s first wife, Donna. Because the wake was held at their home, the expense of the funeral parlor viewing and service was eliminated altogether, and the graveside service was kept simple. Respect was paid, but the price tag was kept reasonable. While the choices you make for such a situation will be personal ones, I think the lesson here is to pay attention to areas that aren’t particularly necessary. You might also find this article on green funerals helpful. It may come as a surprise the first time you see the Bobby Elvis character serving up home-baked organic muffins to his hung-over cohorts, but the truth is that baking from scratch is a great way to enjoy organic groceries on a budget. Whether you are whipping up some of your favorite gingerbread recipes or trying your hand at homemade birthday cake, starting with basic ingredients is a smart budget move. While the lifestyles of the “Sons of Anarchy” characters might not be ones we all feel comfortable with, there are thrifty habits of note present throughout the episode history. 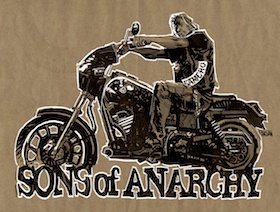 What are your favorite “Sons of Anarchy” moments?